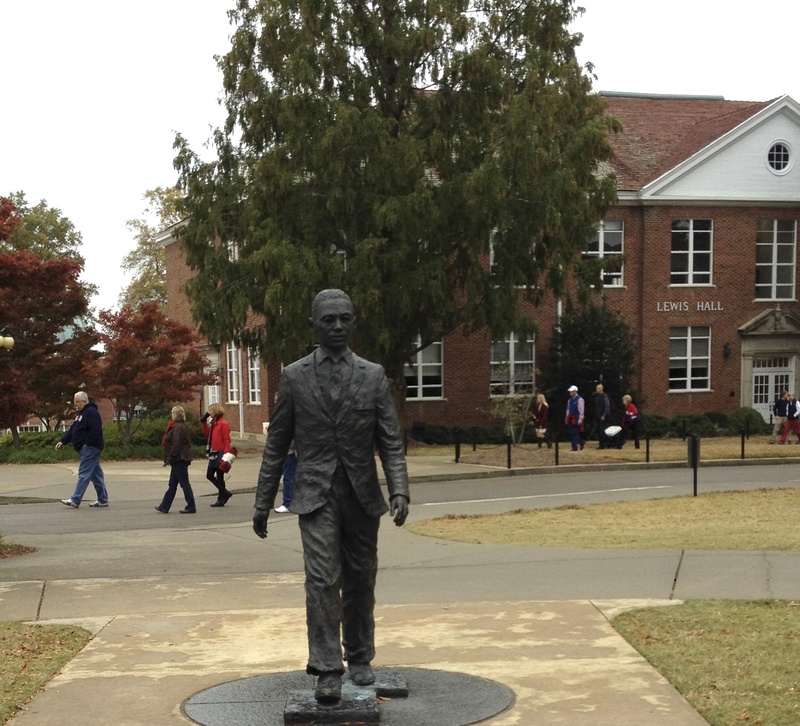 When Dearly Beloved and I went to Oxford, Mississippi to attend an Ole Miss football game in the fall, my cousin took us to see the statue of James Meredith, the first black student to be admitted to the University of Mississippi. The year was 1962 and the Supreme Court had ruled that he had a right to be admitted. He was 29 years old, an Air Force Veteran and had every qualification for admittance except for the color of his skin. Politicians showed up, too, to gin up votes and emotions among the gathering protestors. After the angry crowd grew to a mob of 2,000, additional US Marshals were brought in, bringing the number to 500. Washington sent in 3,000 US Army, National Guard, and Border Patrol personnel as backup to help control the situation. They had permission to use tear gas to disperse the crowd, but were ordered not to fire and they didn’t. The rioters did fire. Two people were killed, 160 of the Marshals were injured, as well as a number of the military support groups. One of the dead was a British journalist found, shot in the back, behind the Lyceum Building. 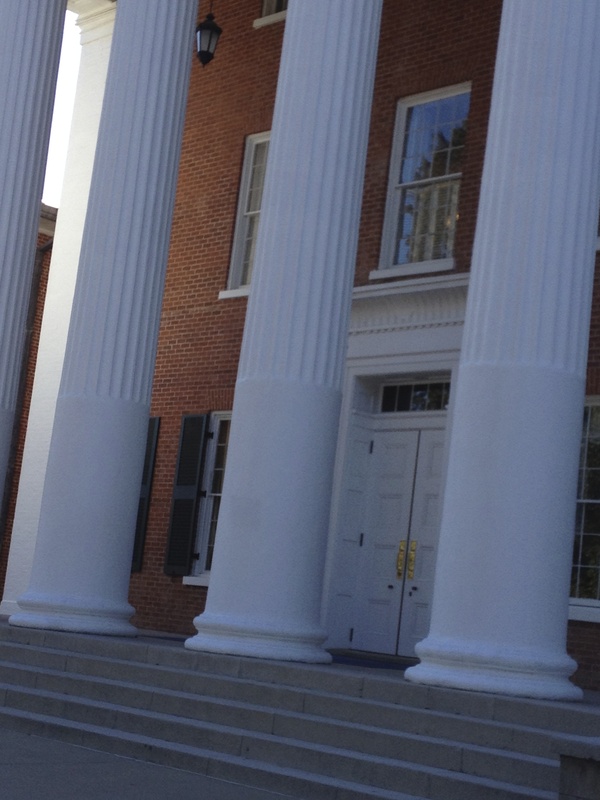 The stately old Lyceum building, the first one built on campus, was completed in 1848. Union Troops took it over during the Civil War and used it as a hospital. Bullet holes in the columns and over the door reveal evidence of racial strifes a century apart. 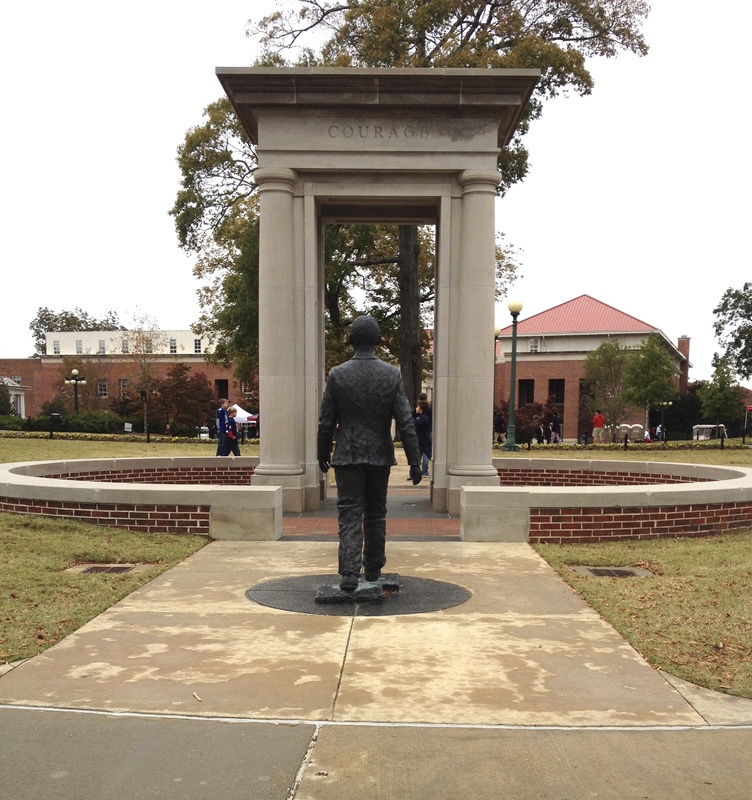 A life-sized statue of James Meredith was erected near that building in 2006, a permanent symbol of the turning point for the University, the push toward equal opportunity for everyone. After graduating from the University of Mississippi, James Meredith continued his studies and earned a Master’s Degree from Nigeria, a law degree from Columbia University. He wishes the university would remove the statue. The school refuses. Meredith does, however, wear an Ole Miss cap on occasion and has attended football games. He became an active Republican. The University of Mississippi has worked long and hard to move beyond those ugly images and has advanced the cause of equal rights and race relations, not just at the school, but in the entire state and beyond. President Barack Obama and Senator John McCain held a nationally televised debate there on a historic evening in 2008. Member of a dwindling Ku Klux Klan showed up to hang around– without their white hoods and robes–handing out brochures and membership applications. When the statue of James Meredith was discovered this month–Black History Month– with a noose around its neck and an old Georgia flag with its battle emblem of the confederacy, reaction was swift. After it was determined that two 19-year-old members (not pledges) of a fraternity were involved, their fraternity brothers immediately reported them to the University and expelled them from their chapter. Even so, the University has suspended the entire fraternity pending further investigation. A third member of the fraternity is also prominent in the investigation. The school has turned over evidence to state and federal officials. “These individuals chose our university’s most visible symbol of unity and educational accessibility to express their disagreement with our values. Their ideas have no place here, and our response will be an even greater commitment to promoting the values that are engraved on the statue — Courage, Knowledge, Opportunity and Perseverance,” Chancellor Dan Jones said in a statement. An alumni association offered a $25,000 reward for information. The FBI is looking into the crime. All three men have retained lawyers and refuse to speak to University officials or law enforcement unless they are formally charged. A short time after Meredith’s entrance into Ole Miss, Harvey Gantt became the first black student to enroll at Clemson University in South Carolina. My Dearly Beloved attended Clemson during that period. Harvey Gantt graduated with honors, obtaining his degree in Architecture there, then on to MIT for a degree in city planning. He returned to Charlotte and served on the City Council and later, two terms as mayor. A Democrat, he ran twice against Jesse Helms for US Senate and lost each time, gaining 47%, then 46% of the vote. Ironically, James Meredith served on the staff of Jesse Helms. The men took different paths, but went on to distinguish themselves in the cause of equal rights. Mr. Meredith declares he works not toward the cause of civil rights, but equal rights of citizenship. There are discussions now as to whether or not the “frat boys” (as they are referred to in news articles) committed a hate crime. What do you think? It was certainly a hateful one. February is Black History Month. Sadly, it’s White History Month, too. We have come so far and yet have so far to go. In my 81 years I have seen many, many changes. I was thrilled to see that we could actually elect a black president …not once, but twice ! However, in my State of North Carolina I still see such bigotry that it sickens me. I volunteer in a Free Care Clinic and see the very poor in our affluent appearing county and it amazes me how so many here don’t even realize there are people going hungry right under their noses. BTW: thanks for commenting on my blog. I thorougjly enjoyed reading yours and will return for sure. Great post! We’ll have to wait and watch what happens. It must be a burden for Meredith being held up as an icon all these years, which no doubt is why he wishes the statue gone. I loved this post. We have come so far, and yet we still have far to go. True. I think about what segregation was like when I was a child and I am amazed at how far we have come… and then I read some of the things that still happen and am sickened. I think people are already forgetting how it used to be. Odd how with similar experiences,Gantt and Meredith gained such different perspectives. Surely the beginning of change should be celebrated. I found that most interesting, too, Patti. 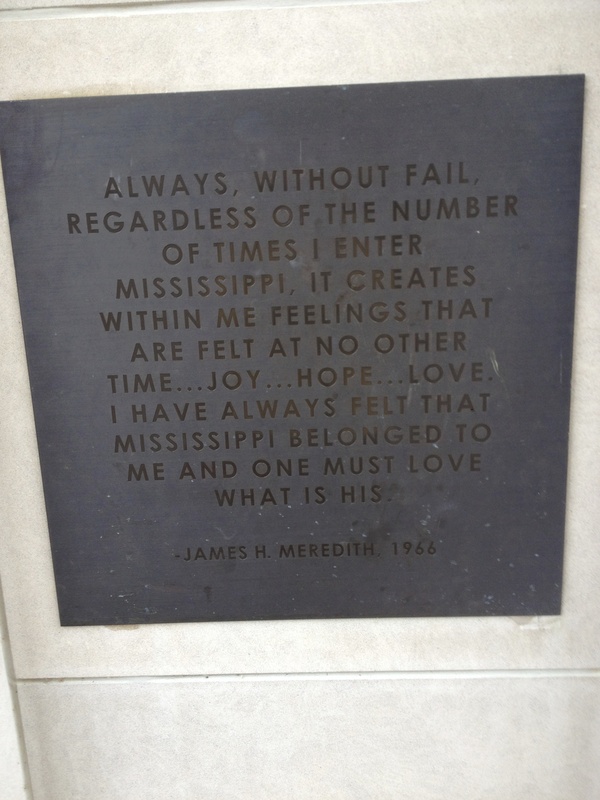 Meredith now resides in Mississippi. I think I’ll read more about him to see where his beliefs were shaped. Harvey Gantt still lives here in Charlotte. He was an outstanding mayor and would have, I’m sure, made us proud had he been elected to the Senate. It seems that Black History Month has received less press than in previous years. Nicely done post. I know exactly why Jesse Helms hired James Meredith. What I cannot figure out is why James Meredith would have been willing to work for him. Before we left NC for the first time, Jesse Helms was a commentator on WRAL who closed their programs each night with “Dixie.” (Admittedly a lovely version). When we heard Helms was running for US Senator, we thought it was a joke. But we didn’t laugh long. Oh. . . and thank you. I saw this quote today in The Mississippi Press: “Teenagers have been committing pranks and doing foolish things forever, and blacks will be out of their minds if they were planning on going to Ole Miss and let this distraction turn them away,” said Meredith, who spoke Friday at a black history program in the south Mississippi town of Lumberton. Well done! When you think of all the struggle he (and others) endured just to be able to get an education, it’s mind-boggling. Great post—and great photos!